At L3 Narda-MITEQ we believe in order to have a successful company you must begin with exceptional employees. As a result of the dedication and technical excellence of our employees, L3 Narda-MITEQ designs and manufactures a superior line of high-performance components and subsystems for the microwave electronics community. By joining L3 Narda-MITEQ, you can be a part of our diverse, creative and talented team of employees. We are committed to bringing in new team members that share our values of dedication and excellence. L3 Narda-MITEQ offers a wide variety of career opportunities. Below are some of the exciting careers that are currently available. We offer a competitive salary and a comprehensive benefit package. L3 Narda-MITEQ participates in the federal government's E-Verify program. We believe this system helps support the integrity of our hiring process. With E-Verify we are able to confirm the employment authorization of all newly hired employees through an electronic database maintained by the Social Security Administration and Department of Homeland Security. For up-to-date information on E-Verify, go to www.uscis.gov and click on the `E-Verify' logo. E-Verify is not used as a tool to pre-screen candidates. The E-Verify procedures only apply to those who are hired by L3 Narda-MITEQ. The E-Verify process is completed in conjunction with a new hire's completion of the Form I-9, Employment Eligibility Verification upon commencement of employment. 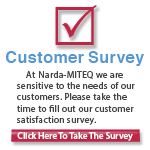 L3 Narda-MITEQ is an Equal Opportunity Employer. Must be a U.S. person to apply for a position. L3 Narda-MITEQ reserves the right to change or terminate any of the benefits listed above without notice.